nb AmyJo: The royal visit is a great success! Having had a great nights sleep I was up at 7:30am and was surprised at how bright it was. I made myself a cup of Tea and sat in my favourite spot, the cratch, that was warming nicely in the sun and clear blue sky. Such a glorious morning and all was well with our little world. Later with sounds of life emerging down below, I made Chris a coffee and some toast for both of us that we enjoyed in the warm sun having rolled up the cratch cover. We then sat watching the world pass us by until 11am when we moved AmyJo across the cut outside the Moorings pub ready to receive the inspection party that duly arrived 15 minutes later. The original plan was to lunch first but as it was early we decided to cruise first then eat. Our friends Derek and Vicky had bought Mary up from Essex for us and so with the help of Derek we lifted Mary, seated on her throne, carefully on board successfully using nothing more complex than an Ikea folding chair and it worked a charm. and touch down safe and sound with Mary loving every minute. With everyone safely aboard we left the girls to the cratch whilst Derek and I cast off and assumed rear guard at the blunt end. After a gentle cruise of 30 minutes to Cracks Hill we winded and then Chris thought it would be nice to carry on to Watford locks and wind just before them. She forgot about Crick boat wash so the cratch covers came back down as we entered the tunnel. I kept a very close eye on the engine temperature. I had told Derek he would need a coat and offered one of mine but he looked at me incredulously. After the first soaking the coat was on quicker than a jack rabbit down a hole. He loved every minute of the trip through the tunnel and marvelled at the workmanship of the navies, savouring the return trip. Meantime the ladies up front were having a whale of a time as we we at the back. Tea was then served. Upon our return to the Mooring pub landing, the inspection took place and Mary toured inside no mean feat for her with just one leg but, again the multi purpose Ikea chair came up trumps, and doubled as a zimmer frame so Mary could get along the boat. For 11quid each those chairs have been a dammed good buy. Bit of a breather before the return to the cratch. I can report AmyJo passed her inspection with flying colours! So having helped Mary ashore using the Ikea lifting method we enjoyed the cuisine in the Moorings. 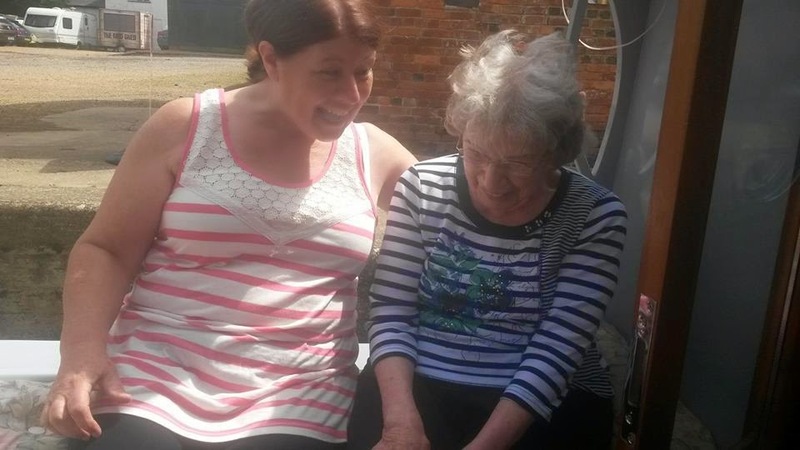 I must say the staff were most understanding about Mary's disability and looked after us really well ensuring Mary was seated where we could get her in with the wheelchair. After lunch it was sadly time for them to depart and for us to put AmyJo back on her mooring. Derek really wanted to help so Chris took Mary and Vicky by car back to the marina whilst Derek and I cruised AmyJo round the short trip to the berth. It was clear all had a great time and Mary loved every minute of her day out. It was so nice for Chris and her mum to have some time together but it must have been very tiring for poor Mary. I bet she slept on the way home! I just realised that was our last weekend cruise from Crick marina. Next weekend we're in Essex to see my parents then the following weekend we start the big trip home to Tattenhall. Can't wait, but I have to say we'll be sorry to leave Crick. Everyone has made us very welcome and we're so glad we have had the opportunity to stay there and make some great friends. Hopefully we can get back and visit one day.